Graceful, conservatively dressed Kate Middleton probably wouldn’t stroll around London in her knickers while brandishing two bottles of booze. However, this is an image none of us will be able to scrub from our dirty, dirty minds after a hilariously filthy error by Netflix. The famously chilled streaming service has mistakenly – yet perfectly – aligned two very different documentaries, one on top of the other. And – apologies in advance your majesty – the effect was humorous enough to have even Queen Elizabeth II herself spluttering out her afternoon tea. The top doc was mild, grandparent friendly The Royals, which apparently shows interviews with those who know members of the royal family. The image for this low-octane doc was the classic photograph of a pre-sprogs Wills and Kate kissing on the Buckingham Palace balcony. Her iconic lace gown with modest sleeves and neckline looked breathtaking as she beamed with happiness, mid smooch. The image was of a pair of stockinged, tattooed legs. The lady in the picture appears to have misplaced her trousers, left only in a pair of skimpy black knickers. A thirsty girl, she carries a bottle of bubbly in each hand. Perhaps giving a double toast to the recent royal wedding between Prince Harry and Meghan Markle. I doubt very much this is the sort of documentary which gets screened very often in Buckingham Palace, however it seems the Duchess of Cambridge is more similar to Emily B and Cookie Jane than you might think. 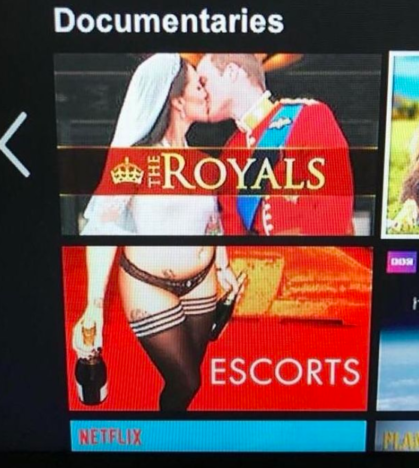 Unfortunately, the team had Netflix had mistakenly spliced the jarring images together, making it appear as though the prim and proper Duchess had gone a bit wild from the waist down. The chuckle-worthy error was noted by Redditor Big_Miss_Steak_ , who shared a screenshot with the title, ‘The risqué side of Netflix’ on Reddit’s CasualUK thread. Fellow Redditors could not stop laughing at the naughty blunder. There is no way that this is a coincidence, Netflix is onto something. Princess Kate has been popping up in some unusual places recently, even making a sort-of appearance at the First Dates restaurant. Fred and his match-making team met Jodie, a Kate Middleton lookalike who has yet to meet her prince. 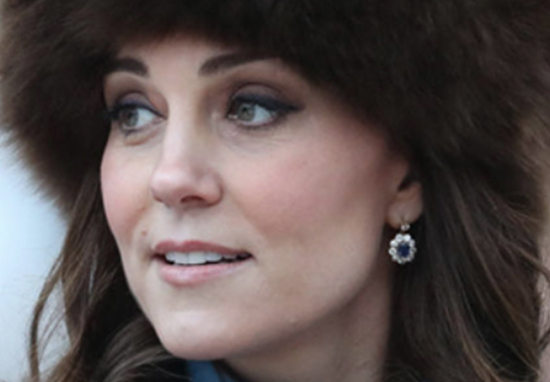 I don’t normally tell people, ‘Hi I’m Jodie, by the way I’m a Kate Middleton lookalike’. That’s not what I do. When she’s in the media, I’m in the media. You just compare yourself to her life and you think that’s totally different to my life. She’s settled with her husband, babies, and there’s just me on my own.